Learn how to cook French pastries, in French. Come to our new Professional Teaching Kitchen at Webster University, and learn French while learning how to cook, with Chef Clémence Pereur. Clémence has a passion for cooking. 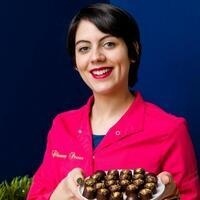 She attended the prestigious school of Chef Alain Ducasse where she passed a diploma in Pastries, with a specialty in Chocolate from "L'École de Paris des Métiers de la Table" (EPMTTH School, Paris). During her studies she worked in prestigious "établissements" such as Fauchon, Yannick Allno's Terroir Parisien, Christian Constant, or Lepinay. In September 2016, she opened the restaurant/patisserie "Like home" (Comme à la maison) in St Louis.